A.P.S. Closed Cell Neoprene is a highly resilient and flexible black Closed Cell Neoprene Expansion Joint Filler. A.P.S. 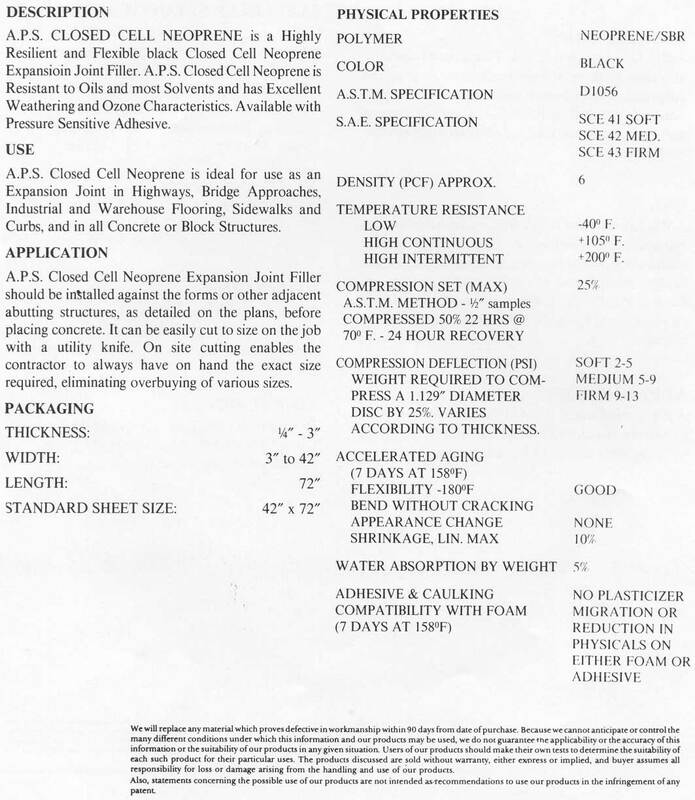 Closed Cell Neoprene is Resistant to Oils and most Solvents and has Excellent Weathering and Ozone Characteristics. Available with Pressure Sensitive Adhesive. A.P.S. Closed Cell Neoprene is ideal for use as an Expansion Joint in Highways, Bridge Approaches, Industrial and Warehouse Flooring, Sidewalks and Curbs, and in all Concrete or Block Structures. A.P.S. Closed Cell Neoprene Expansion Joint Filler should be installed against the forms or other adjacent abutting structures, as detaild on the plans, before placing concrete. It can be easily cut to size on the job with a utility knife. On site cutting enables the contractor to always have on hand the exact size required, eliminating overbuying of various sizes. Standard Sheet Size: 42" X 72"
Click image for Physical Properties.